Mondrian spent perhaps his happiest years in New York and, as a final act of detachment from his roots, he disinherited his brother and appointed Harry Holtzman as his sole heir and executor. Further to this he wrote his own “idealised” biography that was written as if he had lived in his studio in New York all his life. He described a life that he had never lived – a dream life, pictured as a work of art, and pretended that this was his source of inspiration for his artwork. The liberation of colour was completed in New York City, a painting Mondrian developed with the help of coloured adhesive tape. Here the 70-year-old painter went further in his quest for unity, attacking the opposition of drawing (line) and painting (colour) at the heart of the Western pictorial tradition. The result is a coloured drawing, a linear painting that weaves our accustomed patterns of thinking and seeing into a new fabric. 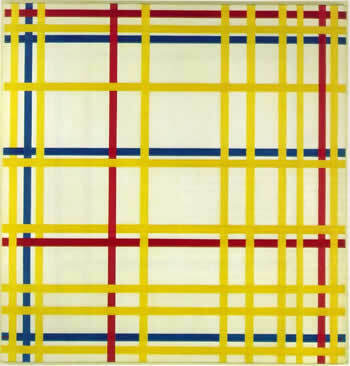 Mondrian’s new materials became the adhesive tape that had just become available in New York. He could now produce his painting far quicker than by repeatedly over painting on the canvas.